Grocery shopping. I’m convinced you either love it or hate it. It’s either a necessary, but shoot-me-now chore, or you relish the hunt for the best bargains each week and sticking to your list and get off on coming in below budget. I’m one of those who falls firmly into the love it category. That being said, we make the big trek to Costco, followed by every store with a circular in a 5 mile radius, once a month and it takes pretty much all day. And that’s exhausting, considering kids are dragging there heels after store # 1, whining the whole way, and begging for this that and the other. We’re all tired and cranky by the end, and cooking dinner is the last thing I want to do at the end of that day. So, yes, on grocery day we order pizza for dinner. The irony, I know. But sometimes the son who works at a local pizzeria decides to take pity on his poor, old Mom, and mix together and toss a fresh crust, and come up with a pizza that will blow our tastebuds away, from scratch. (Really he will jump at any excuse to show off his growing pie-slinging skills). And that’s how we ended up not doing delivery, but some home made gourmet. Mmmmmm…. Hand tossed pizza crust smoothed over with a base of creamy Alfredo sauce, studded with creole seasoned shrimp, sautéed onions, and garlic, then topped off with generous handfuls of melted Colby Jack and Provolone cheeses, and finally sprinkled with crispy, crumbled pieces of bacon. Wowza! Now THAT is a slice of gourmet pizza. Spread dough onto pizza pan flattening and stretching it out to edges. Use a fork to liberally poke holes in it. Partially bake the crust for 7 minutes before adding topping. Or if using a pre add, store bought crust, follow the package directions before topping. 2. Melt the butter and olive oil in a large skillet over medium heat. Add in the garlic and onion and saute together, stirring occasionally, for about 5 minutes. 3. Stir in the seasoned shrimp and cook for about 3-4 more minutes. 4. Turn off heat and stir in the lemon juice and parsley. 5. Use the back of a spoon to spread the alfredo sauce out onto the prepared crust. Top it evenly with the shrimp mixture. Next, evenly distribute the provolone slices, shredded Colby Jack, and bacon. 6. Bake the pizza at 450 degrees for 7-10 more minutes. Let cool slightly before cutting so the cheese doesn’t pull off. Posted in Recipes and tagged Bacon, comfort food, dinner, pizza night, seafood. Bookmark the permalink. Remember all those apples we picked awhile back? We told you they wouldn’t go to waste, and once again we’ve got another recipe to deliver on that promise. And boy does it deliver. In spades. Just imagine it; the tartness of Granny Smith apples, the smokiness of bacon and the sharp tang of cheddar are a match made in heaven. They’re a triple threat of Fall flavors that do not disappoint. Even the hubs, who has a self-proclaimed disdain for any quiche (too much egg or some sort of non-sense), and eats fruit only if his life depends on it, gave this dish two thumbs up and a couple of appreciative, unintelligible noises around mouthfuls. In a medium-sized bowl, use a fork to stir together the white flour and salt. 2. Add the butter and shortening and use your fingers to rub them in to the flour until it’s evenly combined and resembles a course meal. 3. Add the cold water 1 teaspoon at a time, stirring in between. Add the water until the mixture pulls together forming a dough. 4. Roll the dough out onto a lightly floured surface until it’s large enough to cover an 8″ pie pan. 5. Line the pie pan with the pastry and stab the bottom section all over with a fork to ensure even baking. Use your fingers to dent the top of the crust along the rim, if desired. 6. Bake the prepared crust at 350 degrees for about 10 minutes, until it just starts to turn golden. 7. While the crust is baking, prepare the filling. Dice the onion, apples and bacon and sate them all together in a medium to large skillet over medium heat, stirring often, until everything is soft. 8. In a medium-sized bowl, whisk the eggs together until smooth and then stir in a bit of pepper. 9. Remove the cooked crust from the oven (remove from heat and set aside if it finishes baking before the filling is finished) and layer the onion, apple and bacon mixture into the bottom of the crust. 10. Gently pour the egg mixture over top and then finish by sprinkling the cheese out evenly over top. 11. Return the quiche to the oven and bake, again at 350 degrees, for around 30-35 minutes or until the top is golden brown and the filling has set. If you aren’t sure if the filling is set, insert a toothpick into the center, if it comes out clean it’s all set. Posted in Recipes and tagged Bacon, brunch, dinner. Bookmark the permalink. For those of you who don’t know the hubs, which is probably most of you, let me tell you about his love of all things neat and orderly. To put it bluntly, he can’t function in any other sort of environment. He knows where everything goes, and if one thing is out of place it’s going to systematically drive him crazy. Most of the time this doesn’t bother me since he’ll be the first one to start cleaning or come behind me as I’m cooking and wash the dishes as I go. Even when I get annoyed, I can’t help but appreciate this side of him because he totally balances me out. For example, just last week the hubs went on a two day long streak where he decided that we would pull everything out of every nook and cranny in the house and clean it and organize it. At first I was frustrated since this had clearly not been on my honey-do list for the weekend, but by the end of it I was thankful. Everything was thoroughly cleansed, we’d swapped out spring/summer wardrobes for fall/winter. The freezers had been defrosted and updated inventories made of what was where and when it expired. Instead of dreading taking on these tasks myself and getting them done piece meal, we both felt like we’d accomplished something, we both had help, and we rewarded ourselves the next day by mindlessly relaxing & binge watching a new TV show on Netflix with all the sons. And that had been on my list. So that was the good. The bad? I had several things in the freezer that needed using in the very near future. Several of those things were multiple pounds of pizza dough. So guess what? We had pizza for dinner two nights in a row last week. The sons thought I’d gone and lost my mind. They were thrilled. This was what was on the menu with two pounds of said dough. Several of our favorite flavors and ingredients, coming together to star in one perfect pizza. While I can flourish in clutter, the hubs can’t. The happy medium? We keep each other in sync and have many things to show for it. Not the least of which are some damn delicious dinners! This recipe is a doozie. 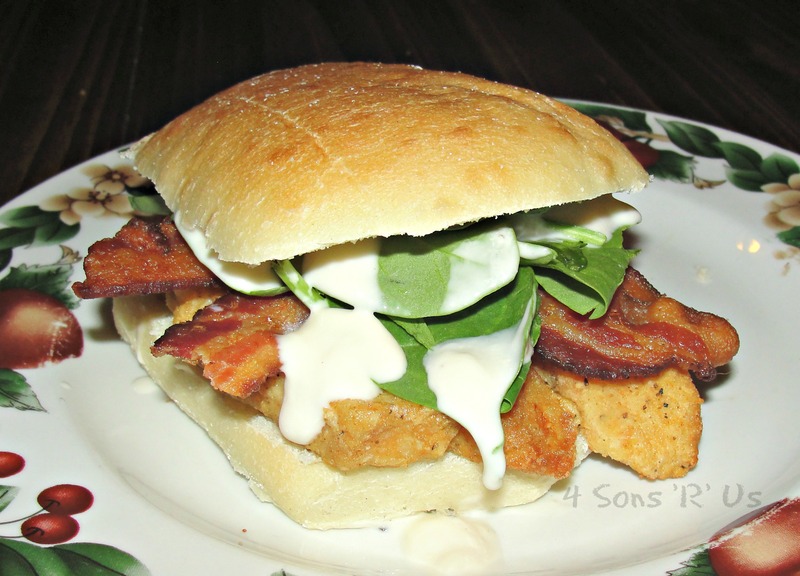 If you love pizza, bacon, chicken, and ranch dressing then you are going to love this. 1. In a small bowl combine all the ingredients to make the garlic-ranch sauce. 2. Spread the sauce evenly over the pizza crust, leaving a 1/2 inch of ‘crust’ all the way around. 3. 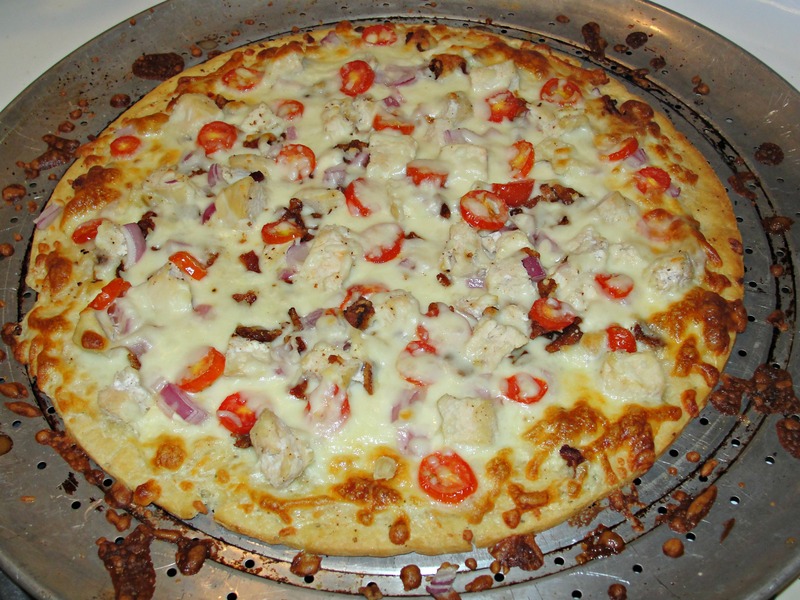 Sprinkle half of the mozzarella cheese over top the sauce, then evenly spread the chicken, bacon, onion and tomatoes. 4. Sprinkle the remaining cheese on top. 5. Bake at 450 degrees for 9-12 minutes, or until the crust is golden brown and the cheese is bubbly. Posted in Recipes and tagged Bacon, Chicken, dinner, freezer cooking, pizza night. Bookmark the permalink. Let me introduce you to our ‘popeye’ sandwiches. They’re packed full of protein with chicken, bacon, and spinach, stacked on a crusty ciabatta, or torta, roll, and (for the pies de resistance) topped with a rich, creamy Alfredo sauce drizzle. It may be green and leafy, but spinach—a renowned muscle builder—is also one of the ultimate power-house foods. It’s also heart-healthy, chock full of vitamins, nutrients, and minerals. Popeye was definitely on to something, which is probably why, now in the food-osphere, spinach is often referred to by the classic cartoon moniker. Hence the name of our sandwich. I’m lucky the sons are down for all this healthy green in just one sandwich, and can pile it on. Maybe it’s just the bacon. Bacon makes everything better. Am I right or what? We lightly bread and fry our chicken breasts, but I’ve used grilled chicken before and this sandwich is just as delicious, albeit a whole lot healthier. The hubs and the sons like their popeye’s as is with the fixin’s pictured, but I love mine with a few thinly sliced red onions and a slice or two of fresh tomato. Doesn’t that just sound like it’d do a body good?! Again there’s no real ‘recipe’ here per se. 1. Cut your roll in half. Add a piece of prepared chicken to the bottom bun. Top with bacon. Load it up with that fresh spinach. 2. Drizzle some tasty Alfredo sauce over top the spinach and top the sandwich with the other half of the bun. 3. Repeat for as many sandwiches as needed and then dig in. Posted in Recipes and tagged Bacon, Chicken, sandwich, spinach. Bookmark the permalink. I had planned to write this post about the delicious zucchini chips we’ve been making all week, but I really need to mention the delicious bacon horseradish dip we made yesterday to accompany them. At first I was concerned that I had made too much of it, but today, as I was eating fresh *healthy* chips dipped into this amazing, tangy sauce, I realized that there is no such thing as too much creamy bacon or horseradish anything. This crowd-pleasing dip gets its smoky, creamy deliciousness from crumbled bacon and smooth sour cream. And its attitude? That’s the horseradish talking. If you’re having a party anytime soon, or anytime at all really, you’re definitely going to want it there. And you won’t have to worry a single moment wondering if you’ve made to much. You’ll have a had time getting guests away from it. But, don’t worry about that either, it’s one heck of a great conversation starter! 1. 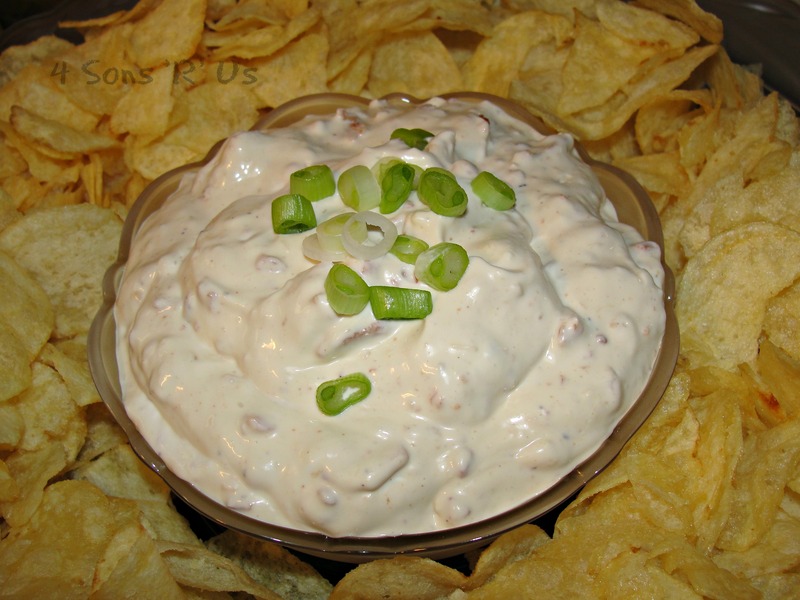 Combine the sour cream, mayonnaise, horseradish, Worcestershire sauce, salt, garlic powder and salt in a medium bowl. Stir in the cooled bacon. Refrigerate until chilled. Top with green onions before serving. 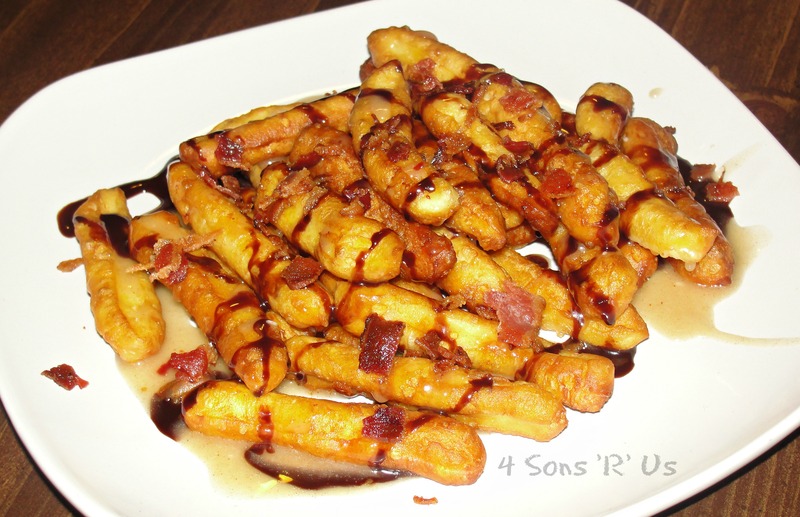 Posted in Recipes and tagged appetizer, Bacon, dip. Bookmark the permalink. Ohhhh, I’m going to be such a bad influence right now. I mean, if you are trying to eat super healthy or stick to light salads for dinner you might want to look away. Except don’t! Because we all need a little cheat now and then, right? And this one is totally (and I mean TOTALLY) worth the splurge. 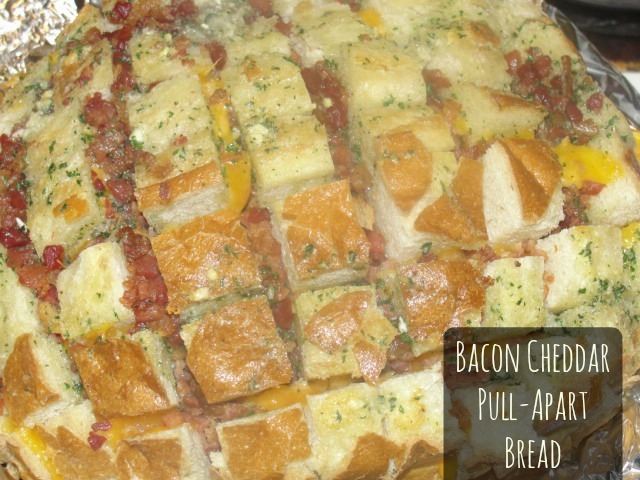 Delicious, rich, doughnutty, sweet, and with just the right amount of crunchy bacon bits…. Loaded Maple Bacon Doughnut Fries. On the stove top. In about 5 minutes. This was our splurge breakfast to bid adieu to the boys summer break on the morning of their last day before the start of a new school year. I’m totally not a morning person, and with 3 babies getting dropped off in quick succession while trying to get the sons organized and out the door (not a single one of whom is a morning person either) there’s not much chance of a home-cooked, hot-meal. I keep make ahead’s on hand in the freezer, like breakfast biscuits, breakfast wraps, and even frozen omelet ‘cups’, but it’s not always the same as something Mom’s made fresh. Then there’s always the good ol’ fashioned bowl of cereal with milk. So, needless to say, we needed one last BIG hoo-rah before we’re all back in the land of re-heated breakfast bites. This was perfect. Full of decadence. Just a little bit naughty. Almost like sneaking dessert before the rest of the world had even had their first sip of coffee. Thought you had to have a fancy doughnut pan to make homemade doughnuts? NOPE. Thought you’d have to make batter from scratch? NOPE. Thought it probably just had to be complicated to reach that level of pastry delight? NOPE. One can of store-bought, refrigerated biscuits and 5 minutes and you’re in business. 1. In a medium sized skillet, heat two inches of vegetable oil, over medium heat, to 350 degrees You can use a candy thermometer to monitor the temp. Turn your heat down slightly to prevent the oil from getting too hot. 2. While oil is heating, preheat oven to 425 degrees. Remove biscuits from container, press into flattened, wider circles and cut into strips lengthwise. Now, using your hands, roll each cutting into a long string, about the thickness of a pencil. Cut in half if necessary. 3. Once the oil is ready, slowly drop biscuits into oil. Bake for about 20-30 second on each side until the dough has turned a golden brown. Using a pair of tongs, remove the ‘doughnut’ from the skillet and set on some paper towels to drain off the excess oil. When finished deep frying, leave your candy thermometer in the oil until it is completely cooled. When cooled it will be safe to dispose of the oil. 4. Sift the powered sugar (this will ensure a smoother glaze). It’s recommended, but not absolutely necessary. Set aside. 5. Melt the butter in a small pot. Once melted, stir continuously until it turns a golden brown. Immediately remove the pot from heat. 6. Pour the browned butter, maple syrup, and milk over the sifted powdered sugar. 7. Vigorously, whisk until smooth. 8. For a thicker glaze, add only 1 tablespoon of milk instead of two. Or add additional powered sugar. To make glaze thinner, add additional milk. 9. If using Hot Fudge sauce, heat it briefly in the microwave to make it easier to drizzle over the fries. 10. To assemble the fries, put a bottom layer of doughnut fries on a plate and drizzle maple glaze and chocolate syrup over-top of them. Sprinkle with some of the crumbled bacon. Repeat for as many layers, and/or plates as you want to make. Posted in Recipes and tagged Bacon, breakfast, brunch, dessert. Bookmark the permalink.